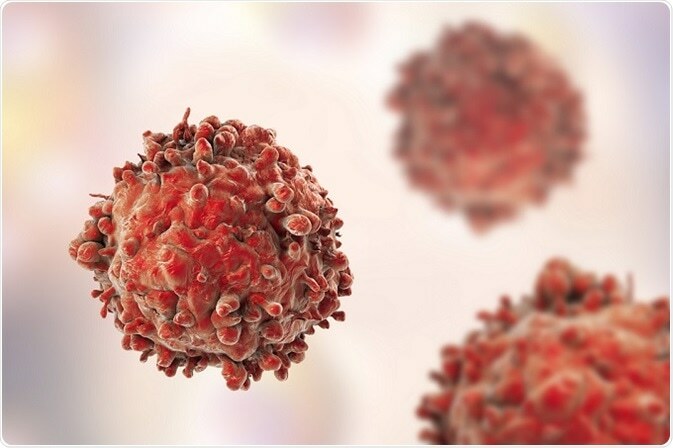 There are four main types of leukemia distinguished by both the type of blood stem cell affected, myeloid or lymphoid, and the progression of the cancer, quickly progressing (acute) or slowly progressing (chronic). Leukemia is commonly believed to be a childhood condition and accounting for around 1 in 3 childhood cancers diagnosed each year it is the most common childhood cancer diagnosis. In particular, acute lymphoblastic leukaemia (ALL) represents over 75% of cases and is a quickly progressing cancer that affects the lymphoid stem cells. ALL is however the exception, as it is the only type of leukemia that is more prevalent in children than adults. The reality is therefore that leukemia is not only a childhood condition, but a cancer which affects people of all ages. The prevalence of other leukemia types does differ in adults of different age groups. ALL remains the most common in young adults between the age of 16 and 24 years old and then acute myeloid leukemia (AML) becomes the most common diagnosis from this age up to around 49 years old. Over the age of 50 years old, cases of chronic lymphocytic leukemia (CLL) become more prevalent than any other but the number of AML and chronic myeloid leukemia (CML) cases are still relatively high. How do the symptoms of leukemia vary by age? It follows therefore that the symptoms of leukemia can vary between ages, as the presentations of the leukaemia types are relatively different. On the other hand, as they are all cancers of the blood, there are overlapping symptoms. The most frequently experienced symptoms and signs across patients of all ages and leukemia types are: fatigue, shortness of breath, fever and night sweats, bruising or bleeding, joint or bone pain, and sleeping problems. These symptoms and signs are a consequence of the leukemia cells filling the bone marrow and causing failure of production of the normal blood cells. Consequently, lowering levels of oxygen-carrying red blood cells could lead to anemia and hence fatigue. White blood cells normally fight infection, but reduced levels of healthy cells and non-functioning leukemia cells means that patients are more susceptible to infection, which can present in many different ways. Other symptoms and signs including fevers and night sweats are likely to be a consequence of the burden of disease. Increasing and overwhelming levels of unhealthy leukemia cells in the bone marrow could be a cause of bone pain. The increasing levels of leukemia cells are stuffing the bone marrow full of sickly cells and you can imagine this to be similar to an overfilled carrier bag about to break open. Sometimes, however, particularly with chronic leukemia types there are no symptoms or a slow development of symptoms over a long time which may go unnoticed to the patient. In acute leukemia types, the quickly progressing nature of the cancer can mean patients very suddenly develop symptoms within a matter of days. This would mean that to a certain extent, you can expect a number of leukemia diagnoses to be made as an emergency. Then again, the number of emergency diagnoses of leukaemia is currently very high. 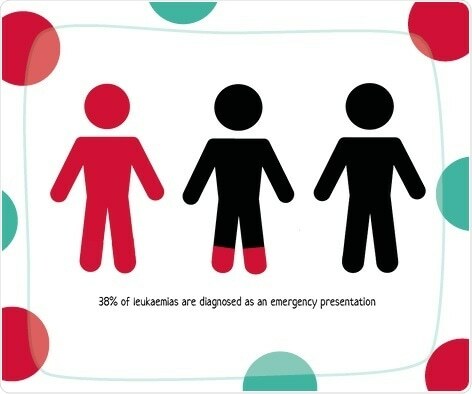 The national cancer average is 22% of patients diagnosed by emergency presentation, yet for leukaemia this is 38%. Acute lymphocytic leukaemia then has the highest rate of any cancer type, with 64% of patients presenting as an emergency. The issue here is not necessarily to do with numbers but the stories behind the numbers. In an overwhelming majority of cases (83% according to a recent survey1) patients do not expect a cancer diagnosis based upon their symptoms. Many patients will report experiencing symptoms but wrote them off as part of getting older or a consequence of a busy lifestyle. This demonstrates both how the symptoms of leukemia are similar to those of common, unrelated problems and how patients are not aware of the signs and symptoms of leukaemia. You then factor in that many are not aware that leukemia is a blood cancer, nor aware that it affects people of all ages and consequently for many there is a lack of urgency in visiting their healthcare professional when experiencing symptoms. This patient delay is however only half of the story in late diagnosis of leukemia. GPs play a crucial role in ensuring that leukemia is recognised and diagnosed quickly. Generally, a blood test is enough to indicate the diagnosis. Unfortunately, there are a number of stories where patients have been visiting primary care for weeks and even months before a blood test has been done. A number are given antibiotics for infections or pain killers for relief of their pains and only after several visits is a blood test finally done to confirm the diagnosis of a leukemia. Delays in diagnosis can have a significant impact on the outcomes of patients, relating to survival, response to treatment and even quality of life for the patient. This is why being able to spot leukemia is so important. The patient stories show a clear need for better awareness of the signs and symptoms of leukemia in the public, alongside GPs educating themselves to better recognise the possibility of leukaemia and request blood tests on patients. Ultimately, this may improve the diagnostic experience for patients and save lives. Professor of Clinical Haematology at Queens University, Belfast and consultant haematologist at Belfast City hospital, Dr McMullin has an extensive specialist practice in myeloproliferative neoplasms and acute and chronic myeloid leukaemia. Research interests include the investigation of the causes of erythrocytosis and pathogenesis of polycythaemia vera and myeloid leukaemia. She was chair of the NCRI MPD sub-group (2006-2011) and chair of the British Committee for Standards in Haematology (2011-2014) and president of the Haematology Association of Ireland (2010-2011). 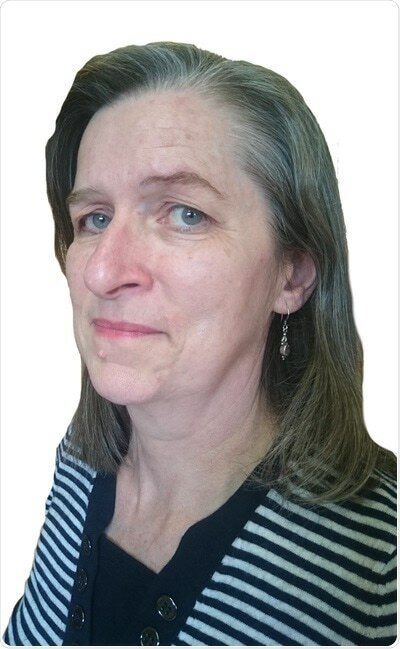 She has served as haematology associate editor of the Journal of Clinical Pathology since 2008. Her teaching portfolio is extensive at undergraduate level in Queens University Belfast where she is second year and careers lead for the undergraduate medical school and at postgraduate level where she has taught haematology widely including for the European Hematology Association.